Simply sprinkle three tablespoons of this powder (one package) onto 16 oz fresh shredded green papaya (one large papaya), then add 2 tablespoons of water and mix well. 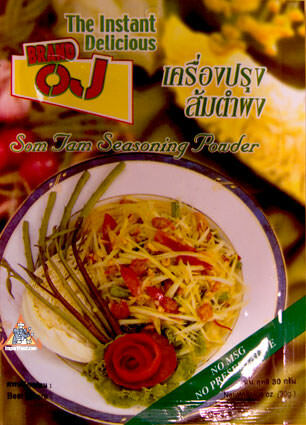 Instant Som Tum, with fantastic authentic flavor! Garnish with your own sliced grape tomatoes, cabbage, fresh green beans, and crushed peanuts if you like. See our feature demonstrating how to make som tum from scratch. We also sell: fresh green papaya. Ingredients: sugar, salt, fish sauce powder, tamarind powder, lime juice powder, chilli, garlic. No artificial ingredients, no preserviatives. Product of Thailand. Kom Kom Miracle Knife. Made by Kiwi, in Kom Kom brand. Found in every Thai restaurant we've ever known. The very best knife for beautiful preparation of fruits and vegetables, and a great "shredding" tool for traditional recipes such as Som Tum (green papaya salad) and fresh spring rolls. Wonderful for carrots and cucumbers. Designed years ago in Thailand, "Miracle Knife" is extremely efficient and the package contains great instructions. Use the unique triangular tip to carve beautiful patterns, swivel the blade to pare, slice and peel, and use the handle to core. The New York Times recommended this same knife. 9.5" length. Made in Thailand. Pro-Peeler, Kiwi Brand. The "Pro Peeler" which has a straight blade like a traditional peeler, and it's perfectly suited to peel the green papaya for som tum. The blade & handle are very well-made from the finest material, typical of Kiwi brand which is Thailand's finest. The peeler has a great feel in your hand. 6" total length, blade is 2.25". Made in Thailand.